The controversial tenure of PGI’s Deputy Director Administration Meeta Rajivlochan ended abruptly today after the Union Heath Ministry ordered her “premature” repatriation to her state cadre, Maharashtra. The Finance and Contract Committee of the municipal corporation, at its meeting held here today, deferred the decision of granting permission to the Market Welfare Association, Sector 22, for setting up a podium. 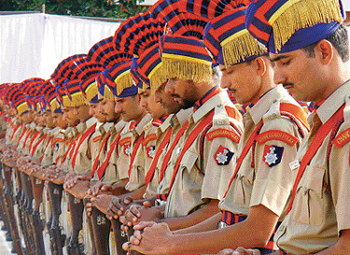 Chandigarh Police personnel reverse arms during a parade to mark the Police Commemoration Day in Chandigarh on Thursday. Five persons, including a woman who survived a CTU bus passing over her, were injured when a “Speed” movie-like incident happened on the road dividing Sector 22 and 23 today. For 27 city residents it is a dream come true as they have become millionaires overnight. They were today allotted industrial plots at rates which were prevailing in 1982. This means they will pay about Rs 67 per square yard whereas the market rate is Rs 10,000 per square yard and above. The Reserve Bank of India today allowed the Chandigarh Administration to collect all types of bills at its sampark centres, enabling single-window clearance of various bills at the special counters. 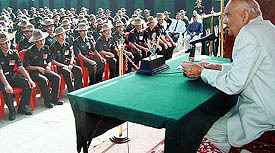 With violence in strife-torn state of Jammu and Kashmir (J&K) is coming down and inflow of tourists being at an all-time high, the state Governor, Lieut-Gen S K Sinha (retd) today stressed upon the importance of psychological initiatives to restore Kashmiriat in the state. The Municipal Council President, Ms Seema Chaudhary, today announced that she would hold a weekly “Municipal Council at Your Doorstep” function in different wards here. A warning has been given to the police personnel, who had allegedly beaten up a couple in Phase XI, last night. They were from the Commando Complex here. Mr Daljit Singh Sra, Chief Sub Editor, Punjabi Tribune, was given a warm farewell here today on taking voluntary retirement from the organisation after 26 years of meritorious service. The CTU Joint Action Committee observed a relay fast today. It was alleged by the committee that the administration was purchasing poor quality and costly lower floor buses. A derailment at Kalka delayed trains on the Ambala-Chandigarh-Kalka railway section this morning. According to sources, an engine shunting on the line near Kalka got derailed blocking rail traffic. To facilitate easy filing of income tax returns by tax payers in Chandigarh and Mohali, the IT department has set up special counters at the office of the Commissioner of Income Tax, SCO 45-46-47, Sector 17-A. The Punjab Governor, Justice O.P. Verma, today urged people to fight evil as was done by Lord Rama. A 25-years-old married man hanged himself to death this morning in Ram Darbar. He was under depression due to having been issueless after four years of marriage. The Crime Branch of the Chandigarh Police has arrested one of the alleged murderers of a watchman of Milkfed almost two years after the incident. Burglers had a field day during the past 24 hours in the city. They committed four burglaries in a couple of hours in the separate areas. The Chandigarh police today claimed to have solved three armed robberies in Sector 17 by busting a gang of three persons who have been involved around 10 cases of robberies and theft near the Sector 17 and 43 ISBT. 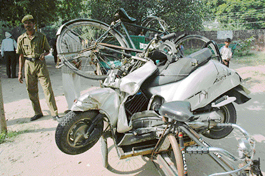 Thieves decamped with nearly Rs 70,000 from a house in Sector 70 here yesterday. The city police has registered three cases of vehicle thefts and one of chain snatching, according to the information released by the police today. Students of Chitkara International School today celebrated Dashera on the school campus. Under the banner of Koshish, the master trainers club, members schools organised “Tal fortnight”. The Chandigarh Administration yesterday provided relief to city schools by allowing schools a concession in the payment of annual lease money. Woman advocates, who constitute about 20 per cent of the total strength of advocates practicing in the Punjab and Haryana High Court, are an angry lot. The Chandigarh District Consumer Disputes Redressal Forum-II today directed Maruti Udyog Limited and Messrs Modern Automobiles, Chandigarh, to replace the entire suspension system of a 1999 model Maruti-800 car with a “new and defect-free system”. After making horror and suspense-thriller films like ‘Raat’, ‘Kaun’ and ‘Bhoot’, Ram Gopal Varma is ready to take the centre stage again. His new suspense thriller and horror movie ‘Vaastu Shastra’ will hit the screen today at Piccadily, Chandigarh, Fun Republic, Manimajra, and KC, Panchkula. Sushmita Sen and Chakravarthy in Ram Gopal Varma’s ‘Vaastu Shastra’. THE global appeal of denim is unmistakable. It is synonymous with comfort, style and youth. It has come a long way from being the tough work-wear to its couture avatar on glamour ramps across the world. Despite being rare among men, male breast cancer is rated more dangerous than that in females. The CBSE North Zone I and II Tennis Tournament in under-14 and under-19 boys and girls’ sections began at the tennis courts of Mount Carmel School, Sector 47, here today. 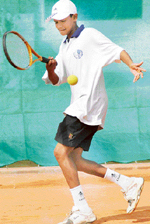 Saurav Sharma of Patiala and Shivangi Bansal of Chandigarh emerged winners in boys’ under-14 and girls’ under-10 section, respectively, of the ongoing Head Total Tennis Championship at YMCA, Sector 11, here today. Manav Mangal High School, Sector 21, will take on Government Model High School, Sector 26, in the under-14 boys’ final of the UT Inter-School Volleyball Tournament at Sector 7 Sports Complex. The Chandigarh Administration yesterday promoted Inspector Inderjit Singh as Deputy Superintendent of Police. He had been put in the gazetted list a year ago. His promotion is ex-cadre meaning he has not been promoted in the queue of cadre posts of DSP’s.